Barbara Rondiat is the referent person for the “women’s” project at the reception centre for asylum seekers, Pierre Bleue of the Red Cross, in Yvoir. As such, she works daily for the empowerment of women. This year, she will travel around the French-speaking part of Belgium to speak about the project with staff from other centres. 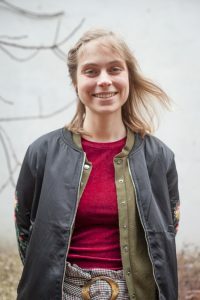 «After my studies in Political science I wanted to specialise on issues of violence against women and I got the opportunity to do an internship at the Belgian organisation “Le monde selon les femmes” (“The World according to Women”). With them I gained a lot of theoretical knowledge, and after a while I started wanting to do some “field work”, to work directly with women and to put into practice what I had learned. I was hired at Pierre Bleue with the main mission being the implementation of the ‘women’s’ project which had already started at the centre. In February 2018 the Pierre Bleue Centre hosted about 140 people, including 40-50 women, forty children, as well as men who are living with their families. At the moment there are only a few single men, about 10-20. « Among the women in the centre, about 20 participate in the “women’s” project. We are a team of 4 support workers on the project. There are 3 social workers from the social office, who follow up on the asylum procedure and the general support to the women. My role is more on how women feel, what their wishes are … Together, the team identifies the needs of women and we call upon organisations to put things in place at a collective level. We’ve had organisations such as GAMS, La Voix des femmes, Femmes & Santé (women and health) … For example, we work on body oriented psychotherapy, with relaxation exercises, or on non-violent communication, our starting point is always the needs expressed by women themselves during individual coaching sessions. We do not decide for them what they need. Our starting point is always the needs expressed by women themselves. We do not decide for them what they need. It’s really important that solutions come from the women themselves. Since 2018, these “safety audits” have become mandatory in all francophone Red Cross centres. Barbara was commissioned to travel to other centres and make a first audit in each of them. Thus, the staff of the centres can learn how to use the tool. Thanks to a technical sheet they can then do it again with other groups of women. In addition to the safety audits, the Red Cross also commissioned Barbara to visit to the other reception centres and talk about the “women’s” project, explain the process and raise awareness about gender and gender-based violence. The idea is to propose the project to women who face GBV and if they wish to propose a transfer to the Pierre-Bleue centre. Do you think there is enough knowledge of the violence experienced by female asylum seekers? « With my colleague who is the FGM referent person we participate in activities organised by CS-FGM, such as the Annual Assembly. Last year, we accompanied women from the centre for a workshop on the theme of FGM and sexuality, organised by the CS-FGM network in Namur. The women were really happy with that morning, it was super! As a result, we decided to invite GAMS and the sexologists who had participated to come to the centre and reproduce the workshop. In the morning there were women of all origins and then the Somali women decided to continue in the afternoon too! What difficulties do you face ? For women who speak Tigrinya, I can’t find interpreters, so I can’t work with them ! You have to learn to keep the right distance, not too close, not too distant. What are the prospects for the women’s project? 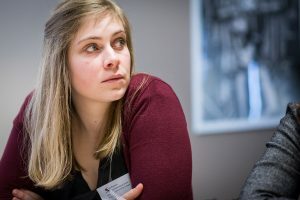 « I would like to be able to go further in the training of staff on the theme of gender-based violence and to increase the collaboration between external organisations, specialised on these themes, and all the Red Cross Centres.